Wow, I'm sorely tempted by the new horse. Looks great DAZ! glad you started a non- official thread so I can say how I feel without dampening the commercial thread. I'm not excited at all!. Sure looks cool but as I feared all my armour is useless. So I'll just stick with what I Have. I can't buy a fully new figure when I never used the old one. Kinda like Hiro5. From an accomplishment standpoint it is still good and all, but for me it's too pricey for something that may very well never get used. and i've really WANTED to use a horse in my pieces for a long time. but I can't throw out my older investment without getting a return first. So the new horse can wait a few years. Not like it will have a replacement any time this decade. EDIT: I'll admit the price puts me off a lot too. fortunately since I am not actually a horsey person, I only have some old horse stuff and only on sale. but since as well as alcohol I NOW cannot eat solid meat for fear of an endoscopsy, I thought, damn, life is short. 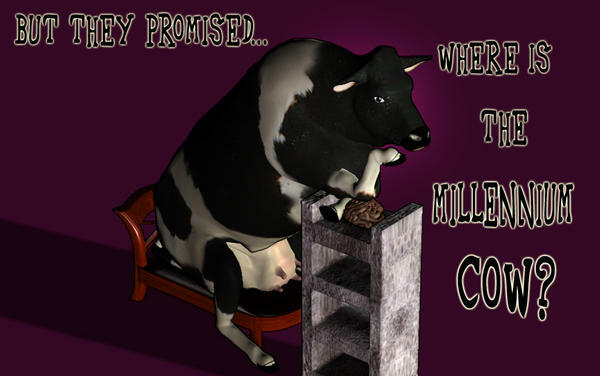 Expect to see the Millenium Cow in early April. I wasn't excited about a new horse at all until I saw the promo renders. Looks very cool. From a backward-compatibility point of view this is a heavy investment though. Some things can probably be moved and parented fairly safely (unicorn horns, possibly saddles with morphs and such), but a lot of stuff is going to be very difficult, particularly armour. But still, we had a lot of that when Genesis came out. Already asked that at the Carrara Forum, though seems no one's a horse-person there ^^ and I am as always reluctant to buy something that's possibly not compatible with Carrara. Has anyone here tested the Horse 2 in Carrara 8 Pro or 8.5 Pro? Can bet your life Wendy will when she's around. I haven't got it yet or I'd have a look. Yeah I could understand that, thing is I didn't get the horse years ago so that's why I'm not stocked to put $80 into it to get what I have now. Granted I did pay a lot less for the horse and armor then if it were new, but I still haven't gotten anything out of the investment. So I still need to use my dogs, cats, horses and dragons in renders before I buy any new ones. I say this but the new horse armor looks neat. Its not for everyone. Dont feel bad and dont let it get you down. Use what you have and be content with it. I just picked up the last horse in the sale. Also can't really justify buying this one at the moment and knowing Daz, it will end up on sale (accidentally) at 70% + off within the next couple of months. So I'll wait until then. Can somebody please be kind enough to give me a morph list? I am interested in getting it, but telling me it comes with so and so amount of morphs means nothing If I don't know exactly what they are. Thanks. :lol: Everyone has seen the horse and says it looks great, but no one has bought it yet . At that price, I ain't. If I remember right that was about the price on the milhorse complete bundle; when DAZ still had it. I would like to get it but it is a bit pricey. I don't want to upgrade to 4.5 yet and would like to know if it will work in DS4. No point in buying it if I can't use it. I was actually coming back to say something to this effect. You're right, I should use what I have and post work it until I'm content. I've tried using the horse in the past but it tends to hold the render back, but I've decided to use it and deal with the quirks. Nice, much better than my horses. Did you use some expansions for the mane? Looks good. DS4 crashed and crashed and crashed on my machine. Installed 4.5 and thought ooh I can actually do something and try this...and I get about 10 minutes into something and BOOM. I might try, but I won't give it more than 30 days because if I can't get this thing to work in that time frame, it's useless to me. Seeing as I didn't get the PC refund, I am not willing to risk getting dumped on again. I might buy it. I returned M5, because I picked up the wrong bundle (showing ALL bundles when I search for it would be kind of beneficial, thanks), of course now that deal is gone (I think, checking later) and they did a store credit -- I will INSIST they return it to my paypal, then maybe pick up the horse instead. She makes some awesome textures :-). I still need to raid her rendo store...lol. OOOOOHHHHHH Yippee a new quadruped to animate! Very excited about the new DAZ Horse II. He will be very welcome at FarmPeep's barnyard! K thanks, i've heard a lot about those and haven't spent any money but maybe one day I will. You do not need DAZ Studio Installed at all to use the DSON Importer. If DAZ Studio Crashes on you, don't load it up. Install the DSON Importer with the proper Poser and just use that. So the new horse requires DSON if you want to use it in Poser? Granted, that doesn't show you what the morphs look like, but the naming can at least give you ideas of what DAZ has tried to include. Basically, look for the "Morphs" section in the "data" hierarchy. The morph filename prefix tells you what kind of morph it is.
. . . From a backward-compatibility point of view this is a heavy investment though. Some things can probably be moved and parented fairly safely (unicorn horns, possibly saddles with morphs and such), but a lot of stuff is going to be very difficult, particularly armour. But still, we had a lot of that when Genesis came out . . .
Genesis has alternate UVs so it can use previous Mil-generations' textures -- the new horse doesn't have an alternate MilHorse UV? Why not? Genesis can (with varying distortion and morph-bobbles, although it's improved lately) use previous Mil-generations' clothes and stuff because DS4.5Pro's Autofit can convert them, but not MilHorse to the new horse? Why not? It's a beautiful and exceptionally versatile new horse, I'm happy it's out! But yeah, why is the investment DAZ's customers have made in MilHorse stuff being ignored?